Reliably providing high bandwidth over DSL is critical to the success of many telephone companies. Jerome Joanny from Assia explained to me at the TelcoTV trade show that it is possible to provide over 100 Mbps on DSL over significant distances if the access network has been optimized. The key to reliably providing high bandwidth DSL transmission includes good management of DSL access networks which includes maintaining the physical plant, optimizing to reduce interference both internal (crosstalk) and external (such as AM radio station and in-home interference). If these factors remain unidentified and are not addressed, this means that the bandwidth on the DSL connection can be dramatically reduced and become unreliable. If the access network is not optimized for DSL, this results in reduced available services for subscribers and higher costs for the operator (customer care, repair, and other costs). 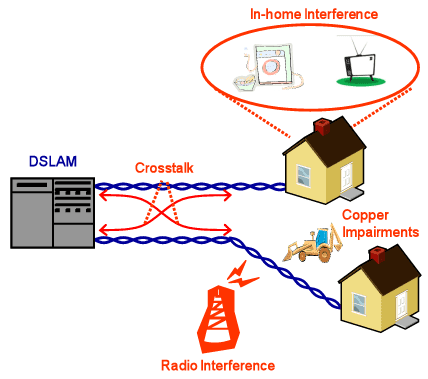 A key solution for DSL optimization is to use “vectored” technology which actively cancels crosstalk and can provide transmission rates exceeding 100 Mbps.